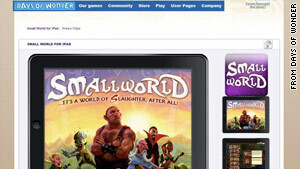 "Small World" and other board games play well on the iPad. (ArsTechnica) -- The iPad remains a gaming device with a lot of unrealized potential. The large screen and touch controls allow for many gameplay options, including board games. We were sent a review code for "Small World," and after checking it out, we're of the mind that the iPad can handle the genre quite well. "Small World" is a French board game that sees different races spreading across a fantasy land, holding onto as much territory as possible without overextending their forces. It may seem a little tricky at first, and the in-game tutorial and instructions leave a little to be desired, but you'll pick up the rules in no time. If you need extra help, more information is easily found online; the physical copy of the board game has been written about extensively. There are unfortunately some major holes here. There is no online play, and no AI opponent to hone your skills against. You'll need another human player to compete against, and you can sit across from your opponent or trade the iPad back and forth. While online play would have been nice, asking $5 for what amounts to a digital version of the board game is more than fair. The real thing would have been $30 or more. There is no way to lose pieces, and you can easily play the game in a car or on a plane. I've been having a good time with it, and I hope more European-style board games make the jump over to the iPad. If there was a premium version released for $10 or more that included online play or computer-controlled opponents, it would be worth an upgrade. One of my favorite iPad apps is Game Table, which simply offers digital versions of checkers, chess, reversi, and poker. For a dollar, that's quite the deal, and I've often challenged the kids to a game when we're bored in the car. Seeing more complicated board games make the jump to the iPad this inexpensively is a good thing, and we hope to see more of it in the future.